:A THREAT TO DEMOCRATIC INSTITUTION AND AN AFFRONT TO JUDICIAL PROCESS. We are Solicitors to Mr. Bright Chimezie (the Applicant in the above referenced suit) and hereinafter referred to as “Our Client” and on whose definite instruction we enter into this correspondence with your good office. Our Client was arrested by the operatives of the State Security Services in Uyo,AkwaIbom State, on the 14th day of October, 2016. Following his continued detention in the most dreaded custody of the SSS, and their refusal to either charge him to Court if he had committed any offence known to Law or release him on bail, we filed an application for the enforcement of his Fundamental Rights in the civil Suit above captioned. All processes filed in the suit were all served on the State Security Services, before the substantive application was heard on the merit. 1. 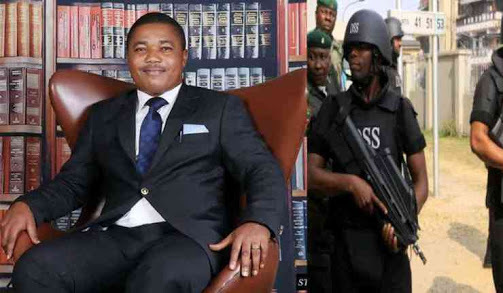 “That the arrest of the Applicant (Bright Chimezie) on the 14th/10/2016, and his continued detention by the Respondent without granting him bail or being charged to Court is unlawful and a gross violation of his Fundamental Right to personal liberty under Section 35(1 and 93) of the Constitution of the Federal Republic of Nigeria. 2. That the Respondent is hereby ordered to release the Applicant on bail or charge him before any Court of competent jurisdiction where there is a prima facie case of commission of crime. Herein attached for your ease of reference is the order of Court, made on the 24thday of May 2017, above quoted. It was served on the State Security Services, the receipt of which was duly acknowledged. On the 30th day of May 2017, a formal communication was submitted with the Director General of the State Security Services, requesting him to obey the order of Court, still the order was treated with brazen contempt and disdain, as our Client was neither releasedon bail, nor charged to Court. Following the continued detention of our Client in flagrant disobedience ofthe positive orders of the Court, we initiated a formal contempt proceedings against the Director of State Security Services, through the filing and service on them, the requisite statutory forms (Forms 48 and 49), Notice of consequences of disobedience to Court Order, and Notice to show cause why the Director of State Security Services will not be committed to prison for his failure to obey Court Orders. Also attached for your ease of referenceare the above referred forms. However, in a desperate but unavailing charade to present an impression of strict compliance with the directives , contained in the order made on the 24th day of May, 2017, the name of the Applicant was smuggled in as the 5th Defendant in charge No: FHC/ABJ/CR/383/2015 between FEDERAL REPUBLIC OF NIGERIA VS NNAMDI KANU & ORS. In the amended chargedated 21st day of June, 2017 and filed on the same date, our Client was charged with two offences to wit: (a) Conspiracy to commit treasonable felony and (b) Improper importation of goods. 1. The two Count charge preferred against our Client in the amended charge, contained offences which are ordinarily bailable in law, such that may not warrantor justify the detention of a subject beyond the statutory prescribed period, before being released on bail. 2. Charge No FHC/ABJ/CS/383/2015 above referred was first amended on the 7thday of November 2016, when our Client had spent well over23 daysin the custody of the State Security Services, still he was not joined as a party, if truly he had committed any offence known to Law. 3. The State Security Services suddenly remembered that our Client should be charged to court, only when the Court order compelling them to either release our Client on bail or charge him to Court was served on them on the25thday of May 2017. 4. Since the amendment of the charge on the 21st day of June, 2017 vide the inclusion of our Client as the 5th Defendant in the amended charge, he has not been produced before the Federal High Court seized of the matter for the purposes of taking pleas to the charge, till date. 5. On record, the charge came up on the 17th day of October, 2017,November 20th, 2017, and 5th December, 2017, but on all of the above dates, our client was not produced in Court, neither was the said amended charge ever mentioned in Court. 6. When the plight of our client was formally brought to the attention of the Court, and the facts of the existing Court order of coordinate jurisdiction directing the State Security Services to release him, His Lordship (Hon. Justice Binta Nyako) declined to comment on the amended charge, as according to my noble Lord, Our Client has not been brought before her, so that she cannot assume jurisdiction over a charge that has not been read or mentioned before her. 7. Implicit in the antics of the State Security Services is that they are in law, still holding our client in clear disobedience of positive orders of Court that directed them to release Our Client. b. Three months from the date of his arrest or detention in the case of a person who has been released on bail. He shall (without prejudice to any further proceedings that may be brought against him) be releasedeither unconditionally or upon such conditions as are reasonably necessary to ensure that he appears for trial at a later date. The above provision of the constitution is unequivocal on the length of time a subject can be detained without trial, and his inalienable right to unconditional release when detained in the manner our client has been detained. It is crystal clear that our Client has spent well over 14 months in the custody of the State Security Services without trial. His continued detention is unlawful, illegal and in flagrant violation of both the positive orders of Court and relevant provisions of the Constitution above referred. It is our respectful submission Sir, that to allow a flagrant disobedience of orders of Court is to strike hard at the foundation of the rule of Law and thereby unwittingly bring about anarchy. See the dictum of ADEREMU JCA in ODUNSI VS ABEKE (2000) All FWLR (Pt. 10) 1625.Justice in its total practical content is truth in action! Justice is much more than a game of hide and seek. Our Client is therefore entitled to unconditional bail in the prevailing circumstance, and we respectfully urge you Sir, to use your good office to prevail on the State Security Services to release our Client without further ado. Recall that you are under constitutional Oath as the Chief Law Officer of the Federation, to protect and ensure absolute allegiance to the letters and dictates of the Supreme Law of the land. You can only be failing in the performance of this solemn duty, if after receiving this letter, you still allows our Client to spend another night in the dreaded custody of the State Security Services. We respectfully observe therefore, that the administration of Justice is the firmest pillar of government. We implore you most respectfully Sir, to respect the sanctity of the judicial process, and accordingly give effect to positive orders of Court of competent jurisdiction by directing the release of Our Client without further prompting. State Security Services is a creation of the Law and is at all times, expected to operate within the confines of Laws establishing the Agency, and not above the law. It is the height of executive rascality and brazen impunity to allow positive orders of Court to be treated with disdain and contempt by the very Agency they supervise. It is time to put a stop to this impunity. Harming one’s inalienable right in order to serve any sinister motive is injustice. In anticipation of your expeditious response in this regard, accept the assurances of our deepest regards.